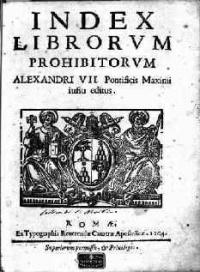 Heresy, according to the Oxford English Dictionary, is a "theological or religious opinion or doctrine maintained in opposition, or held to be contrary, to the Roman Catholic or Orthodox doctrine of the Christian Church, or, by extension, to that of any church, creed, or religious system, considered as orthodox. By extension, heresy is an opinion or doctrine in philosophy, politics, science, art, etc., at variance with those generally accepted as authoritative." The study of heresy is heresiology. Unless indicated otherwise, the text in this article is either based on Wikipedia article "Heresy" or another language Wikipedia page thereof used under the terms of the GNU Free Documentation License; or on original research by Jahsonic and friends. See Art and Popular Culture's copyright notice. This page was last modified 20:01, 4 January 2015.